Do you have VeryPDF PCL Converter on your computer? You can use it to convert PX3 to BMP and set page orientation. Only four steps are required to get the task done, and no other applications are needed to be installed. If you want to have a try, please visit the webpage of VeryPDF PCL Converter, and download it. After installing it on your computer please follow the steps as below to set page orientation and convert PX3 to BMP. 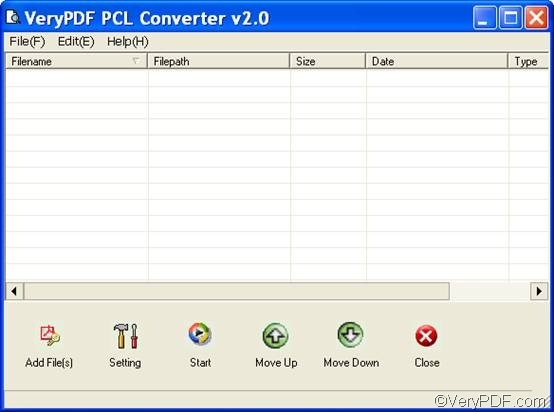 Find the icon of VeryPDF PCL Converter on the screen, and then double click on it. If you are using the registered version, you will see the interface as follows. If you are using the trial version, you need to click Try in the dialog box that pops out. The interface of the trial version is different from the registered one. The former one has a Register button under the list box. Drag the PX3 files from Windows Explorer and drop them to the list box of the interface. Click the Add File(s) button on the interface, select PX3 files in the dialog box, and press Enter. Click File on the left side of the toolbar above the list box, and then click Add Files or Add Directory. Click Setting on the main interface to open the dialog box for settings. Select .bmp from the Output format list. Click the radio box before Landscape or Portrait in the Page Orientation group box. To start the process of conversion process, you need to click Start on the interface, select a folder in the pop-up dialog box, and click OK. The computer will instantly begin to convert PX3 to BMP for you. 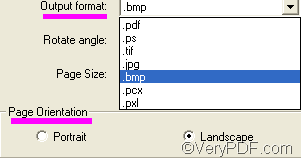 This is the method you can use to quickly convert PX3 to BMP and set page orientation. If you like VeryPDF PCL Converter and want to buy it, please click the Register button on the interface. How to make iPod touch slideshow from presentation? Convert prn to postscript and set page size via command line? This entry was posted in VeryPDF Blog and tagged px3 to bmp, set page orientation. Bookmark the permalink.